my sweet, adorable brother-in-law proposed to one of my besties! I know what you're thinking... Brother-in-law and a Bestie? You're right! It definitely doesn't get much better than that! I have my wonderful brother-in-law to thank for bringing this fabulous lady and fellow North Jersey Girl into my life and now I cannot wait for her to be my sister-in-law! I knew the proposal was in the works for approximately 72 hours (and thankfully no longer than that) because I practically had to fuse my lips together so that I wouldn't spill the beans! They are so in love and I couldn't be happier for them! Luckily, not only was the proposal captured on video, but the bride-to-be's sister also managed to capture the entire event on film as it unfolded! and check out photos of the bride and groom - to be! visited and saw all the pictures at Amanda's blog ...gorgeous! What a cute story! That's so awesome that they have pictures documenting the whole thing! Awww! Love this! Congrats to them both! that's so exciting!! and so fun that the whole proposal is on film and video, love that! What a great story! We have some funny match-ups in this family too--in fact, the husband's best friend just proposed to the husband's younger sister. Best friend's cousin is already married to the husband's older sister. LOL. yay, shout out to me :) Woop woop!! 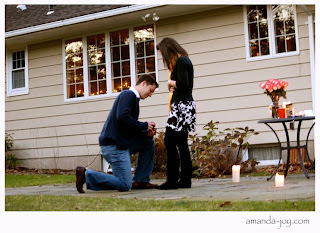 aww how sweet I love love love proposal stories!! so exciting!! congrats to them! Oh how fun to have a bestie be part of your family! The pics on the photog blog are so cute....what a great way to remember the big event. Congrats to you all! oh my gosh!! congrats to her! that's so exciting! What a sweet couple!!! Congrats!